The first match of the night was a rematch of last year's finals with tournament champions from 2011 and 2012, Mika Maatta and Jan Axel Tribler taking on the champions from 2006, 2007 and 2008, Minh Le and Wei Yu Su. Mika and Jan won the first set, but Minh and Wei Yu took the lead in the second, and serving at 5-3, set point, Minh came up with a huge cannonball followed by a crushing volley, only to have Mika flinch back a crazy fast reflex volley winner, bam bam! Two points later, another set point for Minh and Wei Yu, and the exact same thing happens. It was enough to bring Minh to his knees. Mika Maatta and Jan Axel Tribler defeated Wei Yu Su and Minh Le, 6-4, 7-5. In the second semi of the night, Ikaika Jobe and Thomas Shubert gave top seeds Dennis Lajola and Michael Yani a run for their money in a see-saw tussle. Dennis and Michael eventually defeated Ikaika and Thomas 6-4, 6-7(5), 6-1. 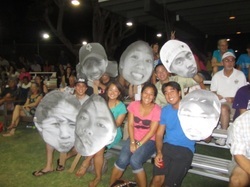 Click HERE to see a photo album of tonight's action from the Star Advertiser! 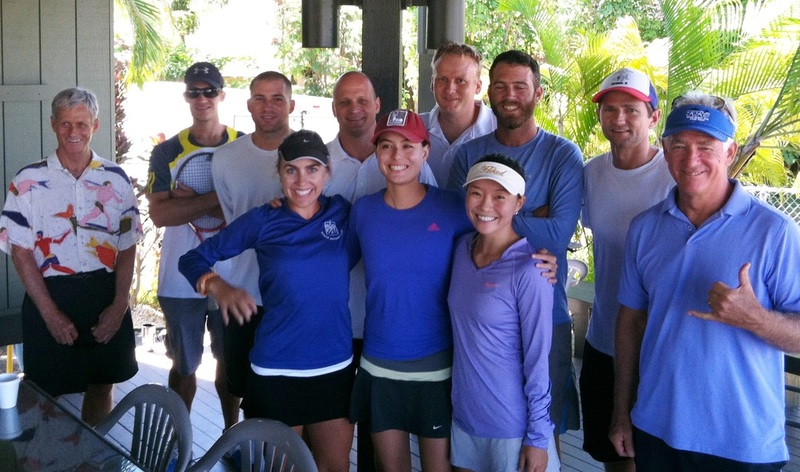 Click HERE to go to an up-to-date tournament draw. Welp, that's all for now sportsfans! I look forward to seeing you at the club.